Dilma Rousseff appears to have won the battle to replace Vale’s CEO Roger Agnelli, as various Brazilian and international newspapers are reporting a more government-minded chief will be appointed instead of renewing mr. Agnelli’s contract. As displayed above the government has strong control over the world’s largest iron ore miner. Valepar S.A., the controlling shareholder, is 49% owned by state pension funds and the government has large influence on two of the three other major shareholders: BNDES, the state development bank, and Bradespar, a daughter of Brazil’s second largest private bank. Key reason for the Brazilian government to push for replacement of mr. Agnelli is the conflict of interests between the company’s shareholders and the Brazilian government. Vale focused on cost cutting in the crisis while the government would have liked the company to keep employment high; Vale had ore carriers build in Asia, while the government would have like to have domestic shipyards build the ships; Vale tries to minimize taxes and royalties paid, while the government tries to maximize revenues. As long as iron ore prices stay high the change of leadership is not likely to have a major impact on Vale’s international behavior. The company will likely get more closely involved in Brazilian steelmaking, potentially allying with Gerdau in development of domestic projects. If prices drop, expansion focus will be more centered on Brazil to please the government. How could the mining industry develop in the period 2011 to 2014? In Red Wave, China’s government manages to sustain demand growth, resulting in high commodity prices. At the same time China invests heavily all around the world, forcing other miners to focus on organic growth. In Countercurrent, revaluation of the renminbi and high interest rates in China lead to lower commodity demand. Prices decrease across the board. Miners struggle to maintain positive margins. New project development becomes of secondary importance. “Chile’s Luksic family is due to receive more than $700m (£433m) this year after surging copper prices pushed Antofagasta, the mining company controlled by the family, to declare a special dividend of 100 cents. 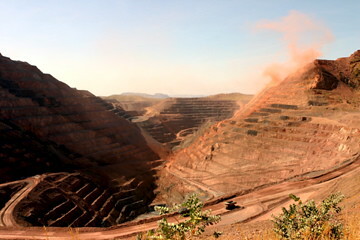 A fivefold rise in the pay-out for 2010 offered proof of the copper market’s financial impact on the mining industry. Freeport-McMoRan, the US copper miner, also declared a 100 cents special dividend for 2010 to clear excess cash. London-listed Antofagasta ended last year in a net cash position of $1.3bn after profits nearly doubled. The strong results published by the Antofagasta are the result of a 46% price increase and an 18% production volume increase. Production for 2011 is expected to be over 30% higher. Cash unit costs increased 8%, in line with increasing costs shown by other companies. In relation to the other big copper mining event of the moment: Lundin and Inmet have delayed their special shareholders meeting to vote on the proposed merger to form Symterra to March 28th to give Lundin time to study the takeover offer announced by Equinox. Equinox has not yet submitted a detailed offer. No problems have surfaced around negotiations with unions on new salary arrangements. Apparently the high copper price has helped the company to satisfy the unions demands, reducing the risk of strikes. Antofagasta is increasingly looking beyond Chile’s borders for expansion: USA, Sweden, Pakistan, and Australia are mentioned in the exploration pipeline. Although all current production is in chile and the Sierra Gorda, Antocuya and Los Pelambres areas in Chile still hold potential, the company will not be able to sustain growth rates it requires to keep up with Codelco, Freeport, and the diversified miners without expanding abroad. This expansion will require significant managerial and organizational change.